National tariff schedules are inevitably detailed and complex, but a broad-brushed macroeconomic picture can be painted using the ratio of custom duties collected to the value of dutiable imports. 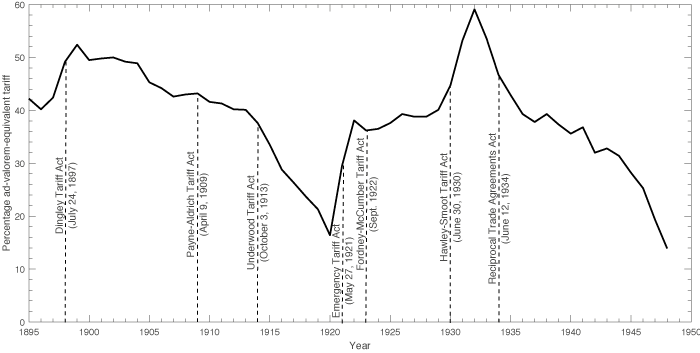 Figure 1 presents this measure from 1895 to 2000. The upper panel covers an early period of unilateral US legislative acts. The lower panel covers the period of formal multilateral trade agreements that followed – the General Agreements on Tariffs and Trade (GATT) and the WTO. Notes: Vertical lines are dates of major legislative revisions (some GATT reductions are phased in). The early period saw a much higher average tariff level, 38.6%, compared to just 8.3% in the modern era. Notice how tariff levels fluctuated wildly above and below their historical average in the earlier period, from 13.9% (1920) to 59.1% (1933), whereas tariff levels have declined steadily from 13.5% to 4.6% in the modern era. What are the causes? In the earlier period, legislative reversals were common, as Congress changed from a Democrat to Republican majority and consequently from liberalism to protectionism (for the most part). The more subtle facet of early tariff-making is the subject of forensic analysis in Harrison (2018). 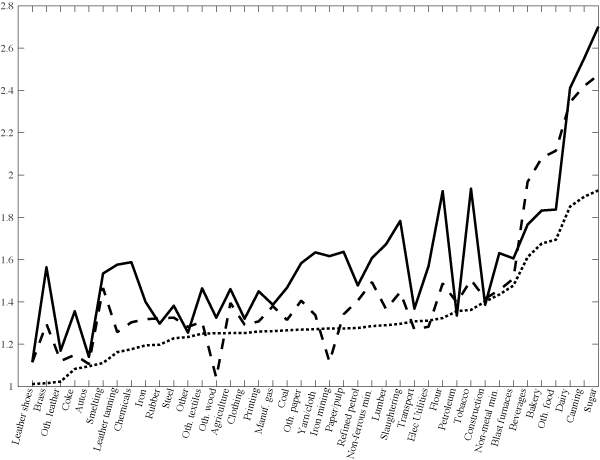 Using a novel archival panel of more than 5,000 line-item US tariffs from 1926 to 1933, he shows that most of the increase in the aggregate ad valorem-equivalent tariff between the Hawley-Smoot Tariff Act of 1930 and the ‘skyscraper duties’ of 1933 are the consequence of the fact that many duties were specific (e.g. 10 cents per pound) and increased as a result of the massive US price deflation of the early 1930s. 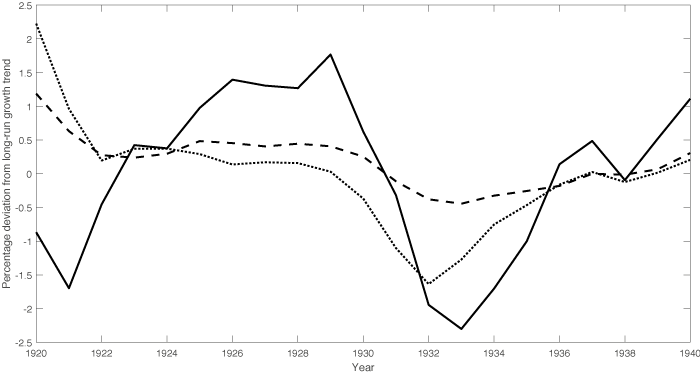 In an earlier paper (Crucini 1994), one of us used a panel of 32 line-items extending back to 1903 to show how the inflation of WWI had the opposite effect, eroding the real value of specific duties until the passage of higher duties in the Emergency and Fordney-McCumber Tariff Acts of 1921 and 1922. The Reciprocal Trade Agreements Act of 1934 allowed the president to initiate bilateral trade agreements guided by the principle of reciprocity, helping to usher in the period of multilateral tariff reductions characteristic of the GATT and WTO. The super-cycles in tariff changes in this earlier era are driven mostly by fluctuations in the nominal price level interacting with a nominally rigid legislated tariff structure. One consequence of this tariff architecture is that it produced a pronounced pro-cyclicality of protectionism reinforcing the negative effects of poorly executed monetary policy and lax financial regulation during the interwar period. This contrasts with the situation today in which tariff increases and foreign retaliation coincide with a robust US economic recovery, with the Federal Reserve keeping policy rates near historic lows. The implication is that any macroeconomic tailwinds associated with these trade policies may be even more difficult to isolate now than was true of the interwar period, a question to which we now turn. Economists have long recognised that it is inappropriate to model permanent and transitory policy changes in the same way. Most of the tariff revisions in the modern era have been permanent, multilateral movements in the direction of freer trade. Economists typically assess the impact of these permanent tariff changes based on their long-run effects. The earlier period, in contrast, is characterised by a series of policy reversals in a comparatively short period of time. While the passage of time reveals how long a particular tariff regime remained in effect, consumers and firms are uncertain about future tariff levels and their expected duration in the course of their real time decision making. To address this volatile policy environment, Crucini and Kahn (1996) developed a two-region multi-sector dynamic stochastic general equilibrium trade model – one region is the US and the other region is a trade-weighted average of its major interwar trading partners. Figure 2 is the model's prediction for the path of US GDP given the actual historical sequence of tariff levels. Movements in GDP reflect the decisions of consumers and firms to adjust their consumption and investment decisions in response to the observed tariff changes, which they understand to be highly persistent. As the figure shows, the cyclical nature of interwar tariff levels generates a business cycle. GDP falls between 0.5% to 1.5% (for the low and high tariff scenarios, respectively) from business cycle peak-to-trough (1929 to 1933) with a recovery starting in 1932 or 1933 (the Great Depression trough). Note that the macroeconomic effects are likely to be much larger in smaller, more trade-dependent, economies (for Italy, for example, see Perri and Quadrini 2002). Notes: Actual linearly de-trended US GDP (solid line), low tariff scenario (dotted line) and high tariff scenario (dashed line). Actual US GDP growth deviations are multiplied by 0.1. When tariff levels oscillate between high and low levels over the course of a few years, they are capable of generating recessions and booms. These macroeconomic effects hinge on trade flows being dominated by intermediate inputs and a scarcity of domestic substitutes. Steel and aluminium certainly fit this description and the recent tariff increases of 25% are comparable to some of the largest increases observed historically. What differs is the fact that the current US and foreign tariff increases impact a much smaller fraction of world trade than was true of the interwar period. Moreover, unlike the interwar period, key foreign suppliers of like products are exempted, thereby affording US firms the ability to adjust their supply chains toward tariff-favoured nations. This reduces the tariff's impact on input costs and aggregate efficiency within the US. The US did not (and does not now) tax all imports at the same rate. However, tariffs were mostly uniform across all trading partners for a particular good. There are literally 1,000s of line items in the US tariff code and, historically, they have included pure ad-valorem duties, specific duties (i.e. the nominally fixed amount per physical quantity imported), and the combination of the two. Bond et al. (2013) created an archive of line-item tariffs at three dates: the six months before and after the Hawley-Smoot tariffs went into effect in 1930, and for the calendar year 1933 (the end of the big interwar deflation). These line items were aggregated into 41 sectors to match Leontief's 1929 input-output tables with the goal of assessing the efficiency effects of the tariff distortions relative to free trade. Notes: Before Hawley-Smoot (dotted line), after HS (dashed line) and 1933 (solid line). Figure 3 shows these 41 sector-level tariff wedges at three points in time, sorted by levels existing before Hawley-Smoot was passed. The first thing to notice is the non-uniformity of the tariff wedges across goods, which calls into question the use of an aggregate tariff index (Figure 1). The tariff wedges range from 1 (zero tariff rate on leather shoes in 1930) to over 2.5 (150% tariff rate on sugar). The second notable feature of the wedges is that increases due to deflation (evident when the solid line is above the dashed line) are often times greater than the increases directly attributable to the Hawley-Smoot legislative changes (the gap between the dotted and dashed line). The combination of heterogeneous tariff levels and differing intensity of input use into upstream production requires a careful alignment of tariff lines by sector in the input-output matrix. We find the tariff increases from Hawley-Smoot, when combined with the subsequent increases due to deflation, induced an aggregate inefficiency of 1.7% (relative to free trade). Moreover, this level of macroeconomic inefficiency is theoretically consistent with the government imposing a uniform tariff of 68% on all dutiable imports. Comparing the observed cross-sector mean (45%) with the counterfactual uniform tariff is a way of expressing the importance of modelling the sectoral input-output structure in the presence of non-uniform tariffs (again, Figure 3). Consistent with this mechanism in the modern era, Kasahara and Rodrigue (2008) provide plant-level evidence of the efficiency-enhancing impact of imported intermediate inputs by firms in Chile. There are similarities and differences between the interwar period and what we see today. President Hoover was fulfilling a campaign promise to help farmers suffering from the collapse of agricultural prices after WWI, while President Trump emphasised the loss of manufacturing jobs to emerging competition from China. Recent tariff increases — while substantial — have at this point been imposed on a narrow range of intermediate inputs relative to the interwar period. Thus, the recessionary impact is likely to be smaller and less widespread provided tariff levels do not escalate dramatically toward levels seen during the interwar period. Bond, E W, M J Crucini, T Potter and J Rodrigue (2013), "Misallocation and productivity effects of the Hawley-Smoot Tariff," Review of Economics Dynamics 16(1): 120–134. Crucini, M J (1994), "Sources of variation in real tariff rates: The United States, 1900-1940," American Economic Review 84(3): 732–743. Crucini, M J and J Kahn (1996), "Tariffs and aggregate economic activity: Lessons from the Great Depression," Journal of Monetary Economics 38(3): 427–467. Harrison, J (2018), "Trade frictions and micro-price behaviors: Historical applications from the United States," Vanderbilt University, PhD dissertation. Kasahara, H and J Rodrigue (2008), "Does the use of imported intermediates increase productivity? Plant-level evidence," Journal of Development Economics 87(1): 106–118. Perri, F and V Quadrini (2002),"The Great Depression in Italy: Trade restrictions and real wage rigidities," Review of Economic Dynamics 5(1): 128–151.